Introducing the Plum vector editor for PICO-8! Made some UI changes based on feedback. Hopefully it's less painful to use now, although it still has a long way to go. You might have to clear your cache to see the changes. Drag an image onto the canvas to use as a reference. Shift-click on the canvas to place a vertex. Click and drag a vertex to move it. Click and drag a midpoint to add a vertex there. Polygons are smoothed by default. Click a vertex to pin/unpin it. Click a midpoint to toggle the edge color. Click and drag on the canvas to select multiple vertices. Hold Shift and drag a selection box to add vertices to the selection. Hold Alt and drag to remove vertices from the selection. Hold Z and drag to delete vertices. Press A to select all current vertices. Press S to deselect all current vertices. Press Q to show/hide edges. Press W to toggle transparency. Colors (below canvas) - Top row is fill color. Far right is no fill. Bottom row is line color. Layers (right of canvas) - Layers are drawn from top to bottom. Drag to rearrange, drag to bottom to delete. 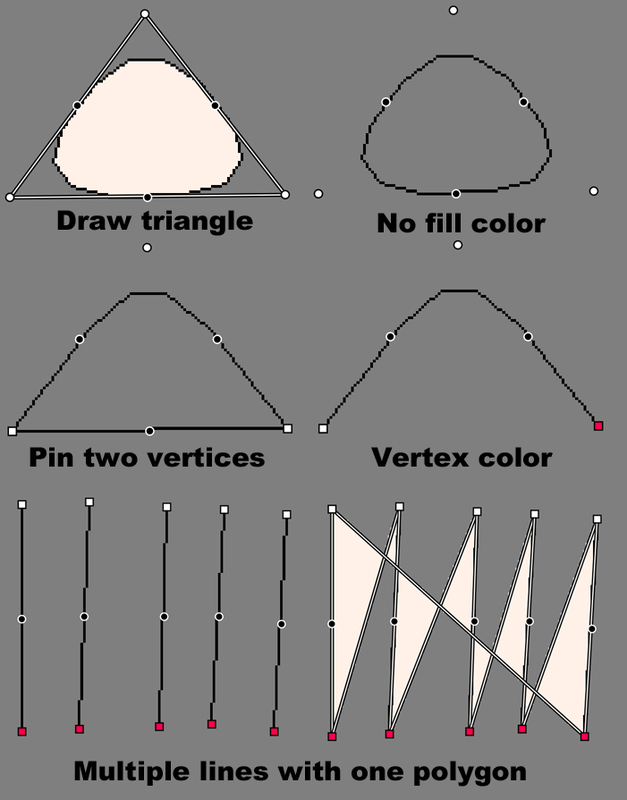 Polygons (right of layers) - Polygons on a layer have the same fill and line color. They also affect each other. For example, to create a hole in a shape, draw another shape inside on the same layer. Save/Load - Copy the top text box for the current drawing. Paste into the bottom text box and press “enter” to load a drawing. WARNING: Pressing “enter” will clear the current drawing. Drag a reference image onto the canvas instead of trying to draw freehand. Use transparency to see your reference. There are only 16 layers, so try to group polygons with the same colors together. The simpler the shapes are, the better. This isn’t really suited for detailed stuff, and small shapes are hard to work with at the moment. Simple drawings means shorter strings, too. You can paste the strings from the demo cart into the editor to see how they’re constructed. I think that’s the important stuff to know. This is still super rough and there are a lot of features I want to add. The UI needs work, too. I’m still learning as I go, so it’s been a lot of trial and error. P.S. The name “Plum” isn’t an acronym, just a character I’ve wanted to make a game about for a while. I couldn’t think of a good name for this editor and she was the first thing I drew in it, so I just named it after her. And here’s a demo cart from an older version of the editor I was working on in LÖVE. Swing a wrecking ball! Smash everything! Thanks to TRASEVOL_DOG for this awesome jam. It was a lot of fun making a game AND designing a TV for it. I might tweak things after the jam is all over. When the line turns bright blue, you have enough momentum to break bricks. You can get the wrecking ball to do a full 360, too. I thought it was cool so I didn't try to fix it. I finally got A* pathfinding working. I know it's already been done in PICO-8 but it was a good learning exercise. Now I hope to use it in a little point-and-click adventure. Splash more puddles than your opponent before time runs out. I think I'll have to call it done for now. But it's playable and there's a win condition, so I'm pretty happy. Still need to work on draw order for the sprites. Hey everyone! Been messing with Pico-8 for a few weeks now and I love it. This game jam seemed like good incentive to make an account and finish my first Pico-8 game. I don't really have any game development experience but I'm having fun learning. The object is to splash more puddles than the other player. Puddles will reappear after a short time. Right now it's just 2 players. A CPU player probably won't happen before the jam ends, but I'd like to continue working on the game and figure that out.